These days, I occasionally write and sell articles, work on my sixth pre-published novel, and maintain this blog. Oh! Wait! 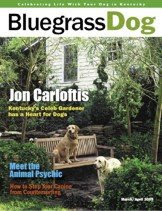 I also write a monthly column for a regional magazine about dogs. Yes folks, I am Dear Labby. My woofs of wisdom ... err ... words of wisdom are not likely to win me a Pulitzer, but I like to think they provide a different sort of edification, one that can't be measured in big dollars or fame beyond furry creatures. Read, enjoy, and hopefully chuckle a time or two. Your sense of humor really shines through in your writing.